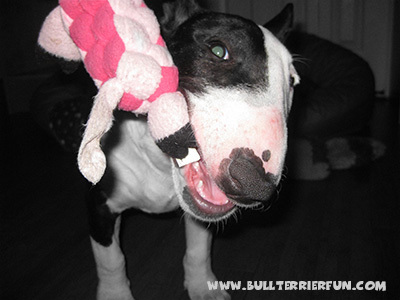 For Bull Terrier owners who like to give soft toys to their dogs, “Tuffy Toys” may be a viable choice. They are currently the only soft toys I buy for Mila, because of their durability. Don’t get me wrong! I am NOT stating that they are indestructible or that your dog should play completely unsupervised with them. All I say is that these toy may be a great choice for people looking for something made of fabric and “kind of soft” but at the same time able to resist a Bull Terrier’s nipping and tearing. Mila has already owned several ones of the Tuffy toys: The sheep, the piggy and the tug o’ war toy. But there are good and … let’s say not so good ones. 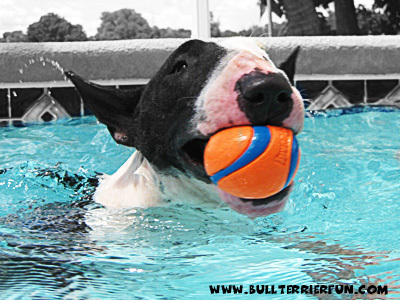 It is usually not easy to find toys that your Bull Terrier loves and that LAST. This is why I spend quite some time on researching toys for dogs and testing them. Just a few months ago I learned that many dogs love spiky balls – Mila is one of them! They often have squeakers and come in many colors and different sizes. And they come with huge differences in durability, too. 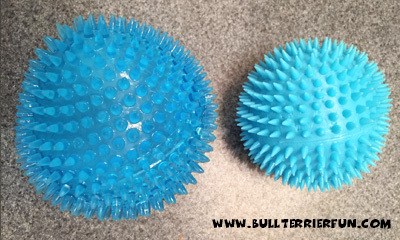 In this essay I will introduce two different balls to you, the Toys “r” us Spiky ball for dogs from PetSmart and the Gnawsome spiky ball. Mila really loved this ball for the time it could withstand her. I have actually discovered the Petstages ORKA Tennis Ball Dog Toy coincidentally on Amazon on my search for durable dog toys and despite being hesitant in the first place decided to give it a try. As for Mila: She LOVED that ball almost as much as she loves real tennis balls. Sadly it was not able to withstand her for longer than two weeks of daily play. The ball is made of some rubber like soft plastic. It can be easily compressed and comes with a textured surface, supposed to improve dental health. Well, actually I am not really sure what to think about that. 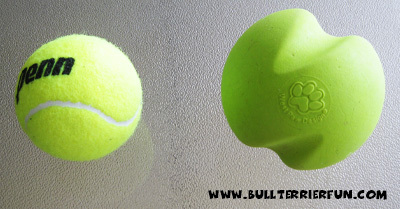 Although described as tennis ball size by the manufacturer, it is actually a litte bit larger, which for a Bull Terrier I do not consider negative, because it lowers the risk of swallowing. The manufacturer also offers other dog toys, some of which I actually may give a chance some day. It has an amazingly irregular and rapid bounce, which really encourages chasing after it. And it floats. Sadly, the blue color is not as visible in the pool as the signal colors of other balls. Chuckit! produces a wide range of toys for pets. Among them there are a lot of Chuckit Dog Balls. Due to the large variety even of balls alone, I will only cover the balls here that I have personally tested with Mila so far. But there will probably be one or the other additional other Chuckit! toy up for testing in the future, because in general this brand seems to stand for durable pieces. 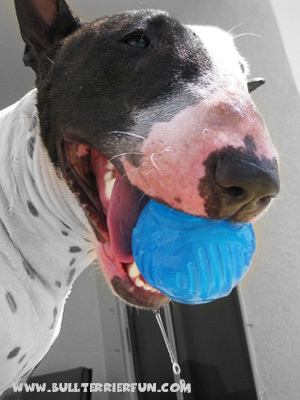 In general when selecting a Bull Terrier toy, always consider the enormous strength of their jaws and their bias to chewing. They will very likely not only push the ball around, but also chew on it, especially if they have access to it over long periods of time. This is why tennis balls for dogs are a choice to think about twice. Many just give their dogs the usual tennis ball that is normally used on the court. A general pro of real tennis balls is, that hey have a pretty good bounce (even “dead” balls) are light and they float. 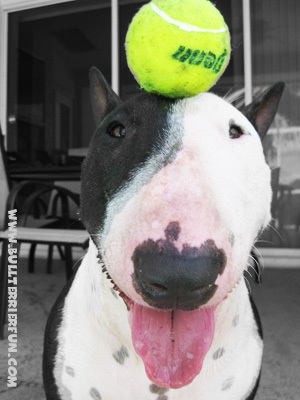 With 2.5 inch in diameter tennis balls have the ideal size to be carried around in a Bull Terrier snout. This is probably why many dogs love them. Tennis balls – especially the more resistant ones made for professional court use – usually have a felt cover that is designed to wear off slowly even under heavy duty. The used materials for this felt cover can have abrasive effects on a dog’s teeth when chewed. This is not only true for Bull Terriers, but for any dog prone to chewing on tennis balls. Also there can be unhealthy chemicals contained in the felt cover of the ball that do not benefit your dog. The ball is available in different colors and it floats. This solid ball is very durable. Although I would not consider it indestructible, it sure can handle some chewing. 2 inch, 2.6 inch and 3 1/4 inch. I have ordered the 3 1/4 inch size for Mila to make sure she can’t swallow it. This size turned out to be a little large for her, especially because the ball is not squeezable at all. Also it is fairly heavy. 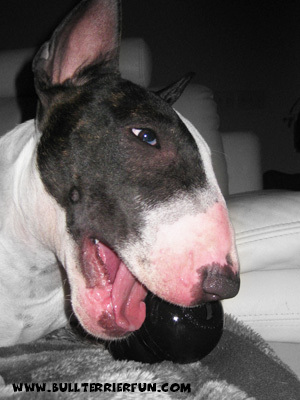 A good ball for very engaged chewers is a rubber ball, such as the KONG. It can be either solid or hollow inside. Hollow rubber balls will yield a little, when chewed, which puts less impact on the jaws, but eventually it’s up to your dog to choose, what it likes to play with. Hollow rubber balls, however, should have THICK walls. These balls are made of durable rubber plastic – which is why they are explicitly labeled for fetching AND chewing by the manufacturer – come in a variety of shapes, sizes and strengths. Red is the normal strength, black is extreme strength. 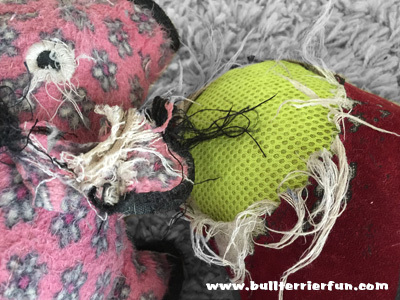 Although every toy sooner or later will find it’s match and in my opinion NO existing toy can claim the classification “indestructible”, these balls indeed are really durable – which makes them a real good choice as Bull Terrier toys. There are Kong balls available in different shapes and sizes and of durability. 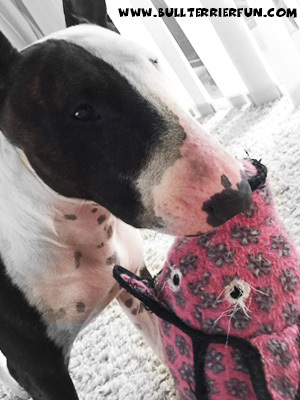 Be prepared to spend some money on toys for your pooch, because English Bull Terriers need diversion or pretty soon they will be up to mischief. If you own a Bull Terrier for the first time, it will not take you long to find out that although they need plenty of exercise, just walking them will not be what can really please or exhaust this breed. In fact, many English Bull Terriers do not even like walking very much. Chasing after a ball until they drop – well, that’s a whole different story. Also many of them are (excessive) chewers. This is why you can’t just give them any toy. You will have to make wise decisions and likely have to look for toys in the upper price range. In general, and this is especially true, if you have a dog with a dismembering habit or a puppy, you should never leave your dog completely unattended and without the possibility of your immediate help (for example in case of choking) while it is playing with toys. Also with most toys ingestion of larger pieces could cause trouble to the point os surgery. Therefore ingestion is something we want to avoid as owners.